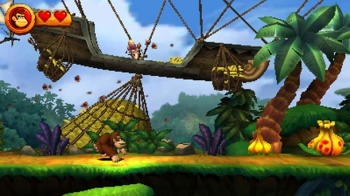 Donkey Kong Country Returns started life on the Wii, but its 3DS incarnation seemingly offers a much more comprehensive barrel-tossing experience. Though we've known for a while now that Donkey Kong Country Returns 3D will make its debut on the 3DS handheld on May 24, we haven't known much about the game itself. Granted, it was established that Returns 3D is a handheld redux of the Wii's Donkey Kong Country Returns, so that takes care of the core plot and major gameplay features, but what will this second attempt at Donkey Kong Country Returns bring to the table? Nintendo president Satoru Iwata generously shed some light on this subject during this morning's Nintendo Direct press conference. According to Iwata, Returns 3D has been designed to take advantage of the 3DS' 3D capabilities, turning its effectively 2D levels into fully-fledged multi-layered stages wherein the protagonists can travel relatively freely between foreground and background sections. Further, Returns 3D adds a new mode to the game (aptly titled "New Mode") that rebalances the original game to be easier. Not only does this include an additional third heart for Donkey/Diddy Kong, it also directly alters the levels themselves to make playing the game more friendly for those new to the title. The biggest addition to Returns 3D however, lies in eight new stages which can only be unlocked once you complete the main game in its entirety. Iwata didn't delve too deeply into these new levels, though he claims that these additional stages will flesh out and/or continue the plot of Donkey Kong Country Returns. Aesthetically, the game looks as you'd expect: Similar to the original SNES classic and its Wii successor, but with enhanced resolution (or, at least, a smaller screen which makes the original resolution look sharper), 3D effects, and a seemingly smoother frame rate. Donkey and Diddy Kong both animate more fluidly than they ever have, but otherwise the title should be very familiar to fans of the original.